... is sometimes the most ancient. Drawn from the sweltering rainforests and dangerous savannahs of Nyambe, Ancestral Vault brings gamers a rich hoard of African-flavoured treasures and equipment. This sourcebook describes mundane d20 System equipment, special and superior items, and magical objects of all degrees of power. Though designed for use with the Atlas Games Nyambe: African Adventures setting, these items can find their way into any campaign as exotic treasures from faraway lands. * New magical rings, rods, staves, wands, potions, wondrous items, cursed items, and aritfacts. * Rules for magical games, and alternative magic item creation feats. * New adventuring equipment, tool kits, ship rules, trade goods, armour, shields, and weapons, as well as fixes for the lack of armour in Nyambe. * Rules for using natural medicine to create ritual scars and herbal concoctions. 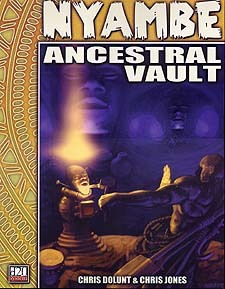 * Magic item tables for all the items in Ancestral Vault as well as those found in Nyzambe: African Adventures.